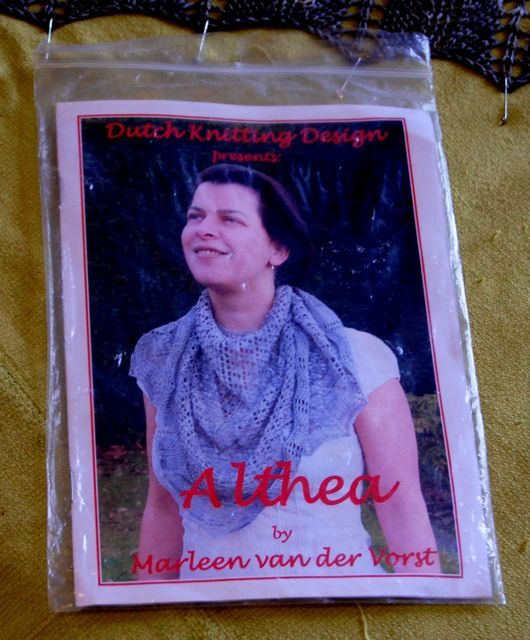 I have been working on Althea by Dutch Knitting Design otherwise known as my friend Marleen Van der Vorst. 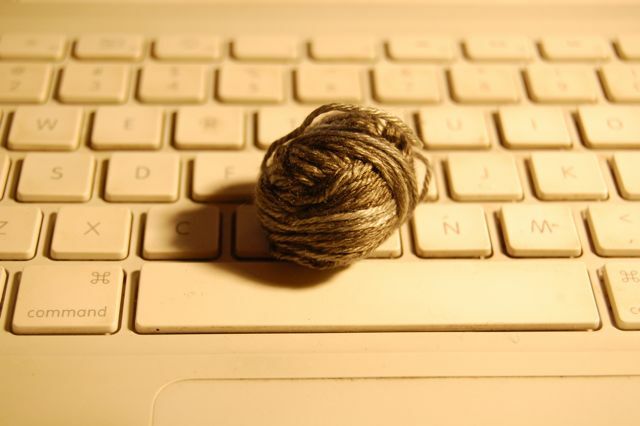 I started this at Woolfest on either the 24th or the 25th of June. Well, that’s not exactly correct as I started this yarn as a different pattern but quickly decided to use Marleen‘s pattern instead. I hauled this shawlette to Knit Nation with me where very little got done on it. 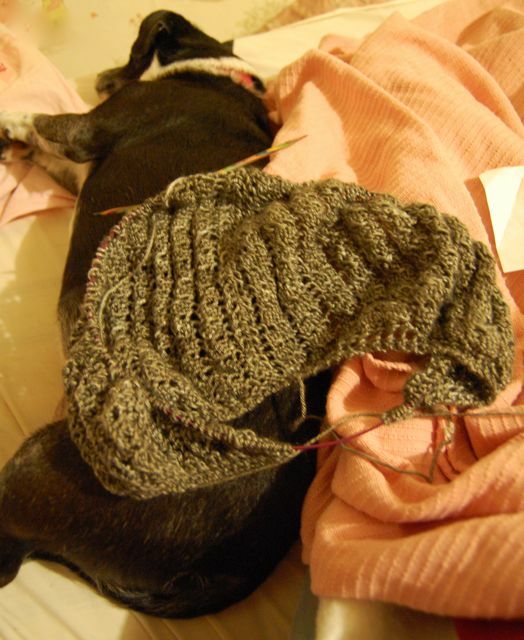 However, I felt that I needed to show Marleen the progress that I was making on one of her patterns. Then I am pretty sure that I didn’t show it to her at all. This project rode in my checked baggage on the airplane home, only to be ignored for weeks on end in favor of Christmas projects and spinning. I packed it into the big white van and it rode to Florida with me to deal with the house and not one stitch was added to it. Finally (finally!) it got packed to go to Sticks and String this past weekend with me which is where we made a connection. I know everyone always says this, but it’s amazing how fast a project goes when you actually work on it! The finish was exciting on this one. I had this tiny ball of only 3 grams left over and that was after deciding to not do the last row of patterned knitting! I gave it a bath in Soak last night and pinned it out early this morning. My blocking board is packed somewhere in the storage unit along with my pins so I sort of had to improvise. That’s ok, I’m pretty good at improvising! This is a cedar chest that is under about 10 layers of blankets with a non-slip rug pad under them all. This princess and the pea set-up is to keep Malcolm and the rest of the crew from scratching the top as they look out the window. On top of all these blankets is a massive towel that my mom sewed out of 3 smaller towels way back in the day to put on the seat of a couch (which we no longer have). I usually use it as a dog towel, but it was pressed into service as a pinning base today. There was no way I was getting a picture of this shawl today without Sweetie Pie in the picture in all of her adolescent glory. She’s actually waiting for me to throw her toy so that she can go fetch it. For real, this cat plays fetch. I didn’t have my fancy quilting pins (in storage as well) so I used a random pack of safety pins. They worked ok! The little gold ones were the best for pinning out the points. When I have all of my blocking supplies together I will give this puppy a much stricter blocking, but this works for now! And here is what it looks like now, blocked and fully finished! It turned out much larger than I expected. I knit and knit and knit on this and it took 97 grams out of 100 in the skein and I, for some crazy reason, thought that it was going to be a lot smaller than it turned out to be. You would think that by now I would have a goodly grasp on the idea that more yarn (usually)=More knitted item. I’m actually quite pleased with how large it is. 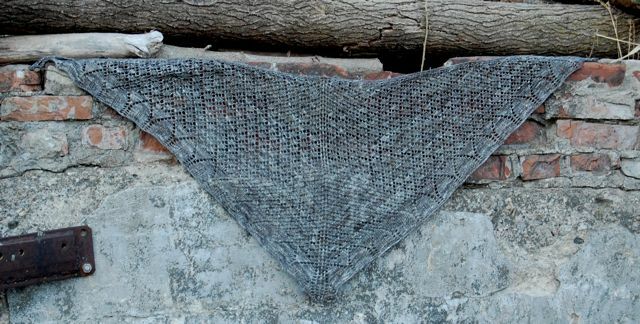 I would be remiss if I didn’t mention one aspect of Marleen’s patterns that I just love! She makes them in these little booklets that fit perfectly inside the plastic bags that they come in. This means that you can just turn to the proper page in the pattern and pop it back into the bag. 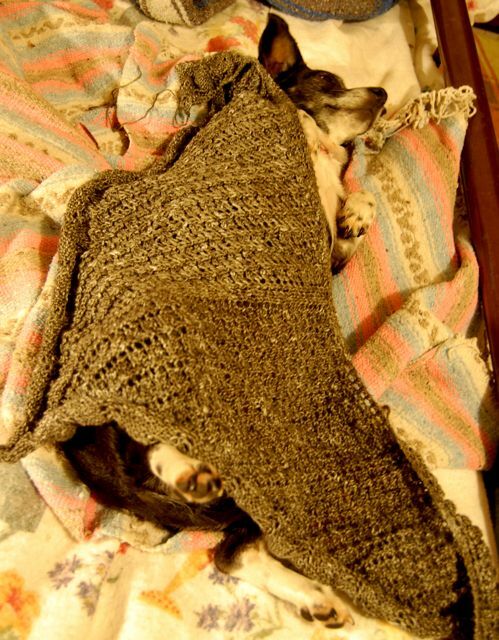 My patterns usually end-up looking (quite frankly) like a hot mess by the time that I am done knitting the project. They’ve been folded and refolded and stuffed into a bag so the ends are all curly, you get the idea! This particular pattern has more than a few miles on it. It’s been stuffed into my purse for weeks on end (never a good thing! ), packed into suitcases and carry-on bags, the works. It still looks wonderful all protected by the plastic bag even after a LOT of abuse. The pattern contains both charted and fully written-out directions as well as multiple color pictures of various aspects of the garment. How many times have you knit something and wished that you could see how it was put together, not just on a super skinny model? Well, Marleen’s patterns have them! 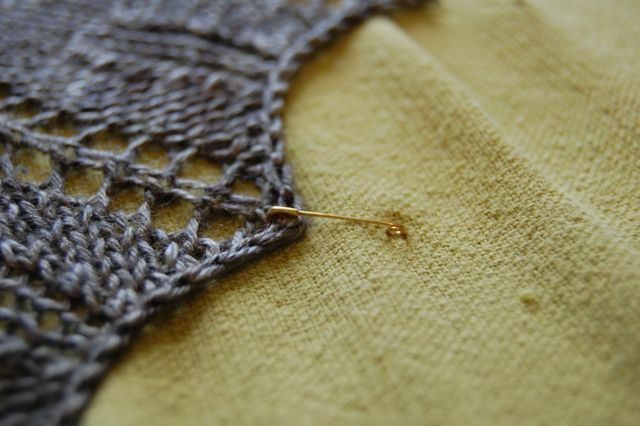 I know I sound all gushy about a pattern, but really, when you see something like this done the way it should be done it’s hard not to get a little verklempt! 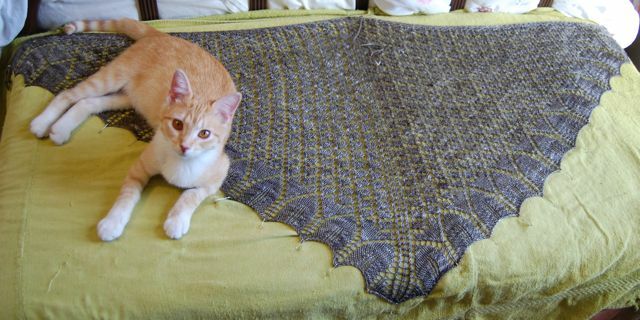 So here, with no more ado, are the glamor shots of the finished and blocked shawl! Obviously no pictures of me wearing it as it is difficult (to say the least) to take a flattering shot of yourself by yourself from behind. However, it goes all the way down my back to the top of my jeans. Yarn: Supreme Sock by Yarn Addict in Earth. 50% Merino, 50% Silk. 97 grams used. I was wishing for some extra at the end of it that I would definitely have had with a Big Boy!! I would totally give you Sweetie Pie (I have too many kitties already) if you were on the same continent. She would give poor ol’ Pickles a run for his money!